Flying to/from Laos? 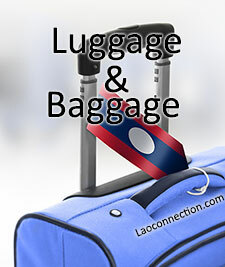 Remember to look into baggage and luggage allowances with the airlines that you'll be traveling with. Otherwise, you'll be hit with hefty excess weight fees. Some airlines are more generous than others when it comes to weight overages but pre-trip planning will save a lot of headaches when you travel. Consider using a scale at home or a portable one to weigh your luggage. Try to travel lightly because you'll want to leave room for all the goodies and souvenirs you'll likely buy when you visit Laos. In Laos, it's important to keep in mind that at the airport your checked luggage will likely be opened and inspected by customs, often times without you being present. This is more so upon departure after you've checked in your luggage at the counter. It's not quite as common on arrival but this can vary. Years ago when they did this you would only be aware of what had happened by how messy the contents of your luggage were once you arrived at your destination. Nowadays when the inspection happens, they don't mess up the contents as much and they place tape on the luggage that has writing on it which states Lao customs has opened and inspected it. It's a much better courtesy than having nothing mentioned of what has occurred. Ideally going forward they should adopt more open inspections with the passengers and second customs agent present. This will prevent any possibility of drugs being planted or items being stolen. One thing that was noted at the Lao airports was that at the luggage claim area, once you've retrieved your luggage and are going to exit the immediate area, they do ask to see your luggage stub and match it to the tag on the luggage you're taking with you. So far I've only observed this happening at Lao airports of Vientiane and Luangprabang. It's a great idea and other airports around the world would be wise to adopt the same policy. It prevents people from mistakenly (or knowingly) taking luggage that doesn't belong to them.